The myCharge ultra portable hi-tech gadget is myCharges largest unit with the highest power output. Designed to replace the heavy and bulky generators used when tailgating or camping, the Portable Power Outlet is a streamlined power source that can run a 32-inch LED television for up to four hours. 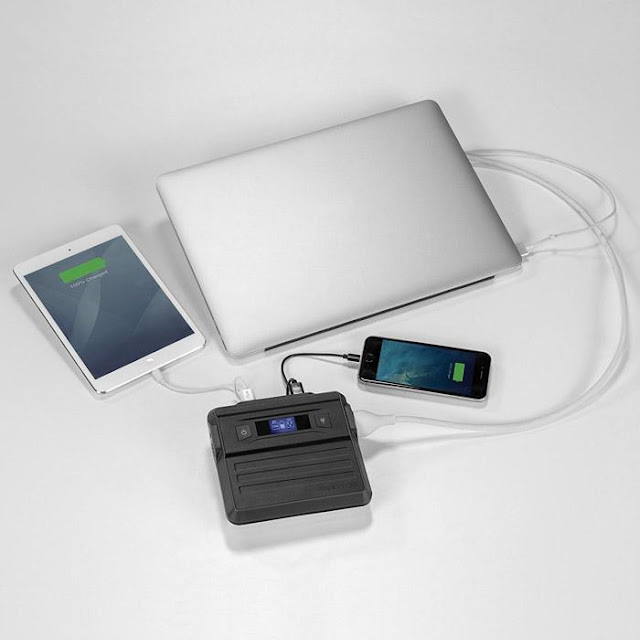 The Portable Power Outlet has a maximum power output of 65 watts, enough to power a laptop. It's built tough, designed well, and is an excellent emergency backup system for most of your electronic systems (phones, tablets, laptops, and bluetooth speakers). One of the interesting features is that the power pack not only features the usual USB charging ports, but it also has a three prong AC power output functionality. So not only can you plug in your USB devices but you can run any standard electronic device you need. Recharges via charging adapter that is included. If you are looking for a high capacity device with the flexibility of USB A, USB C, and a three-prong AC plug then the myCharge Portable Power Outlet is a good one to consider. For more information about the myCharge Portable Outlet, please visit their website and follow on Facebook, Twitter, and Instagram. One lucky reader will win the myCharge Ultra Portable Hi-Tech Gadget! The giveaway is open to US readers ages 18+. Void where prohibited by law. Good luck! I love all the tech stuff, this is very attractive. This would be so wonderful for my husband to have. He camps with the Boy Scouts and this would be great. I have a bunch of usb devices that need to be charged constantly. This is perfect for me. I like how portable it is and how fast it charges. I love that this is portable and has hyper charge. My husband needs this so he can charge up fast.. He's always on-call, and this would be a life changer for him.. God bless y'all for the review. I love everything about it. I need this so bad, my phone goes down and when I'm in an appointment I can't call for my ride. It has happened more than once. A Portable Charger is what I need. We always need chargers and cords in our house. I could use this yesterday! My kids would love this charger. Great for on the go! Oh this would be awesome for traveling and when on vacation out on the boat. I'm always having to change something. Oh this would be great! So funny how we always seem to run out of charge...just when we really need it. Love that it charges fast too! have! So I have to wait to charge my own phone. I have told them to bring their own chargers, but I guess they forgot. This would be great for our road trips! Thanks so much for the chance! I could always use more charging options in my house! Especially would come in handy when traveling! This would be great with the various charging options and I like the size. This sounds great. My household loves gadgets. I need this..This would be great when i travel.. Sounds like a great little charger with lots of power! I sure could use a faster charger. My charger is so slow . Portable chargers are the best...practically a necessity these days! My phone always seems to be dead when I travel. This would come in handy! This would be great for my phone, tablet, and laptop. I could really use this charger. This would be a great addition to a emergency kit. I've been needing to update mine lately. We have so many devices that require charging. I always need chargers! This would be great. My phone is always running out of power, this would be great in an emergency. My phone isn't holding a charge very well these days so this would be great for me. This looks like a great product. It's super useful to have an emergency charging device. This would be great to have at the beach. Wow! This would be great for keeping all charged up! We also have Hurricanes around this area from time to time and I could have used that during the last one! This is awesome. I could use this all the time. Especially when we travel. This looks like an amazing charger. I would love to have one of these. I really appreciate the fact that it charges super quick AND it is small and lightweight. With all the "stuff" I have to carry in my tote it is nice that I don't have to add a lot more weight. I like that this has a rapid recharge function. This looks like such a cool little device that could come in so handy. I like how fast it can charge everything too.